Then, in October 2015, I found myself procrastinating on a news website, avoiding the work I needed to do by scrolling endlessly through depressing news stories. This made me think – wouldn’t it be nice if there was some happy news for once..? And so the plan was hatched. The next two months were spent gradually building the tree. With no guides available online, it was a process of trial and error. The challenge was to create a tree, which whilst looking as close to the real thing as possible, could be easily put on and taken off. It had to be lightweight so that I could run in it, but sturdy enough to withstand the abuse it was likely to suffer over the Christmas period. In the end, I decided to use two mountain-climber rucksack frames – one would go on my front, one of my back. These were connected using fibreglass hoops designed for garden polytunnels, bent into a series of 8 concentric circles. These ranged in diameter from 60cm at the top, to 150cm at the bottom, giving a nice natural tree shape. The whole thing was held together by zip ties, which in my opinion are one of the greatest inventions the world has ever seen. I then purchased a luxurious 225cm fake Christmas tree, and spent hours gradually disassembling it into its wire, string and nylon parts. The individual branches (about 30cm in length) were then attached to the frame in a process that took a couple of days. 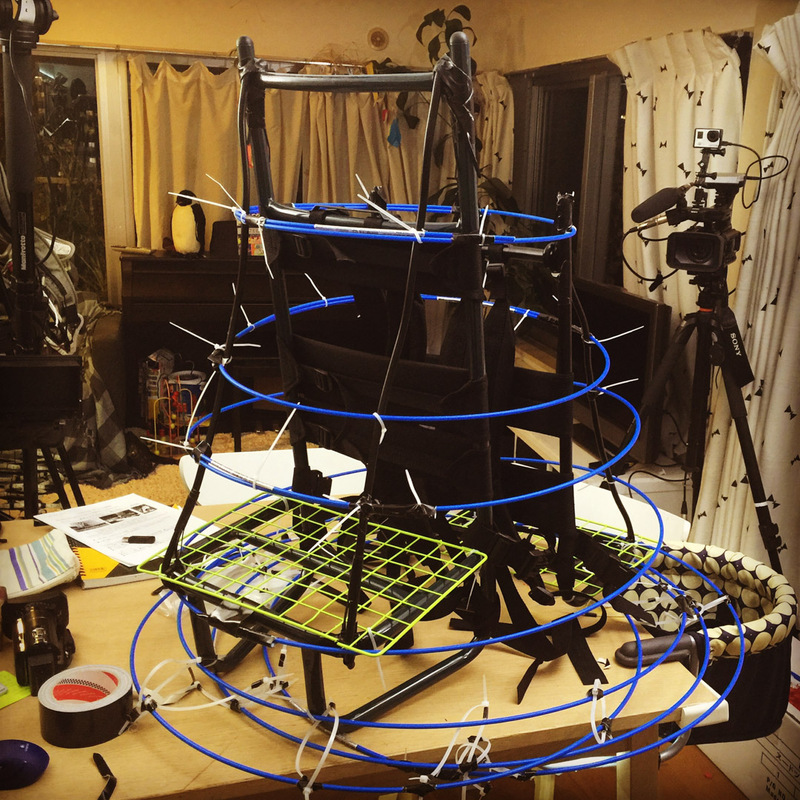 Green material was secured to the inside of the hoops, hiding any gaps through which you might see my body. With that, the basic frame was complete. 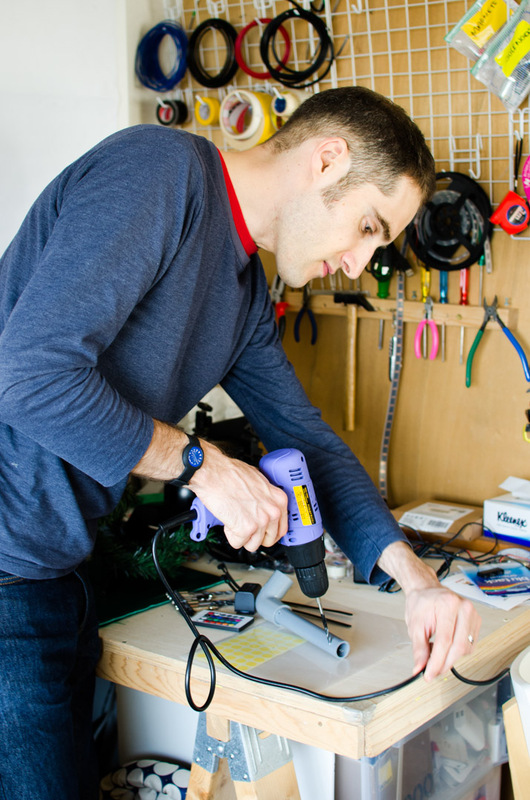 One of the biggest challenges I face with my LED projects is power. Over the past through years I have burnt through countless batteries, accidentally overloading their internal circuits by putting them through strenuous discharge/recharge routines again and again. 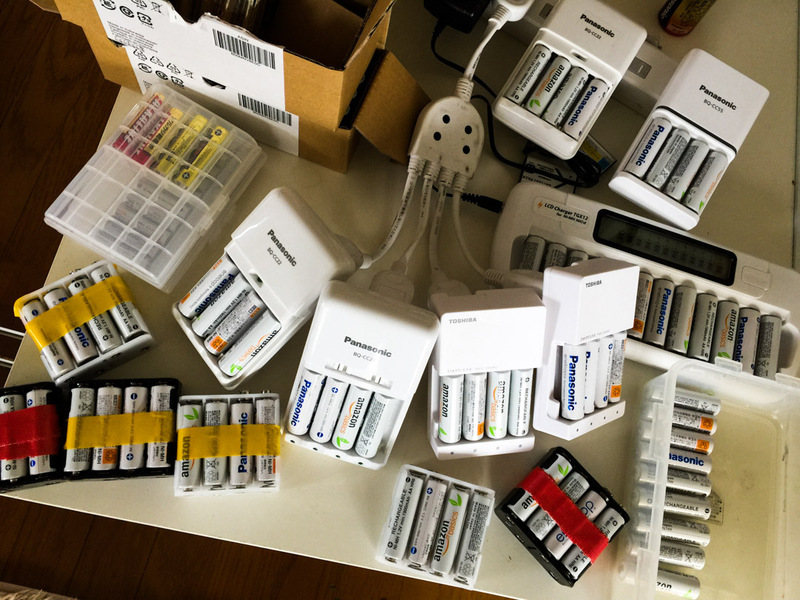 Because of this, over the past 6 months I have switched back to using standard rechargeable 1.5v AA batteries in packs of 8, providing 12v output. These are cheap to buy, and easy to replace should I need to whilst out and about. However, they’re inclined to drop below 12V pretty quickly, so rather than run them at 12v, I use an UBEC (converter) to step the circuit down to a steady 5 volts. Then, rather than use the typical 12v LED strings you see lighting up shop window displays, I use 5V Adafruit Neopixels. These come in strips of up to 4 metres – for the tree I used a total of 24 meters. 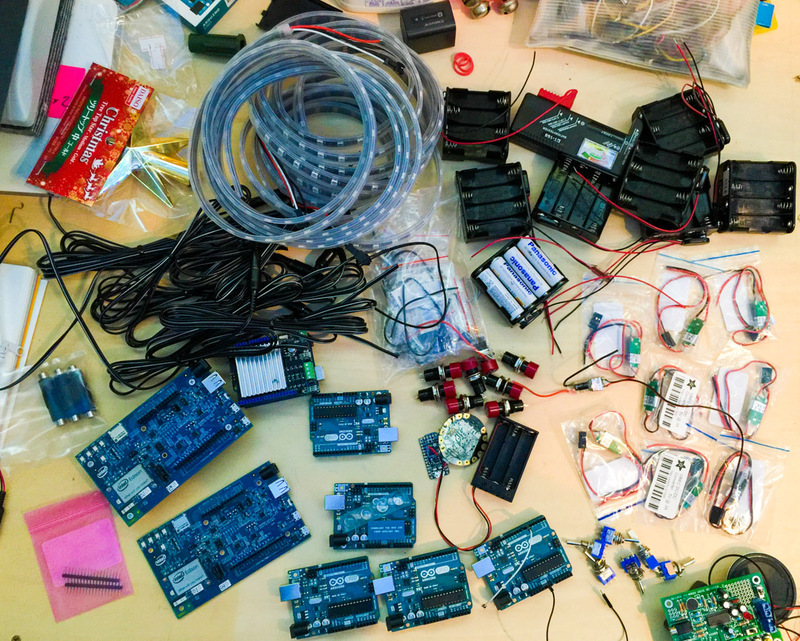 Whilst ideally all of these strings would share a single controller (for example by using a Fadecandy), I was reluctant to do so, as it would also result in a potential single point of failure – if the Fadecandy stopped working for some reason, we’d have no lights at all. Had I had enough budget to make a reliable system and enough time for rigorous testing I might have gone this route, but as I had neither, I instead opted to have what was eventually 13 entirely independent circuits, each with their own Arduino (either Uno or Adafruit Flora). These strips would light up in all sorts of patterns and colours almost in sync, as they all shared the same Arduino code, and were all turned on at exactly the same time by means of two lollipop strips that sandwiched all of the power switches! Soldering all of these circuits took forever: each strip had its own 5V power supply for the LEDs, 9V supply for the Arduinos, UBEC converter and 2 switches. Connecting all of these was over a metre of wire each way, for a total of about 30 metres across the whole tree. The helmet had its own circuits too, not just for the LED strips, but also for the Raspberry Pi powered 16x32 LED matrix that displayed various scrolling Christmas messages. I also attached a couple of large USB batteries to the inner frame, which I could use to charge my phone and power a small LED for my face. The final circuit was that for the speakers. Initially, I’d attached a Jawbone Jambox to the machine, but it just wasn’t loud enough, so I replaced that with a couple of decent sony speakers that I usually use for music at home; usually attached to a mains power adapter, I found a suitable size plug and wired them up to a set of 6 ‘D’ size batteries …making the the whole thing even heavier! I connected the speakers to my iPhone via the 3.5mm jack; the beauty of this was that I could then control the music from my Apple watch – every Christmas Tree should be controllable by an Apple watch! The final touch was to plug in all of the battery packs and add Christmas decorations. With that done, it was complete …and it only weighed 25kg (55lbs!). So, as I mentioned above, the primary reason for making this tree was to entertain people. People here in Tokyo, people across the country, people worldwide. In order to do that we were going to need the help of he media, so as soon as the tree was ready for a test run(! ), I was out on the streets with the very talented filmmaking folks from Breaker Inc in hot pursuit. The shoot, which would take about 6 hours, took us to Akasaka, Ginza, Yurakucho, Shinbashi and Shibuya, all areas that in the past have been very welcoming when I’ve run through them in some crazy gear. This time was no exception – the response was absolutely fabulous. 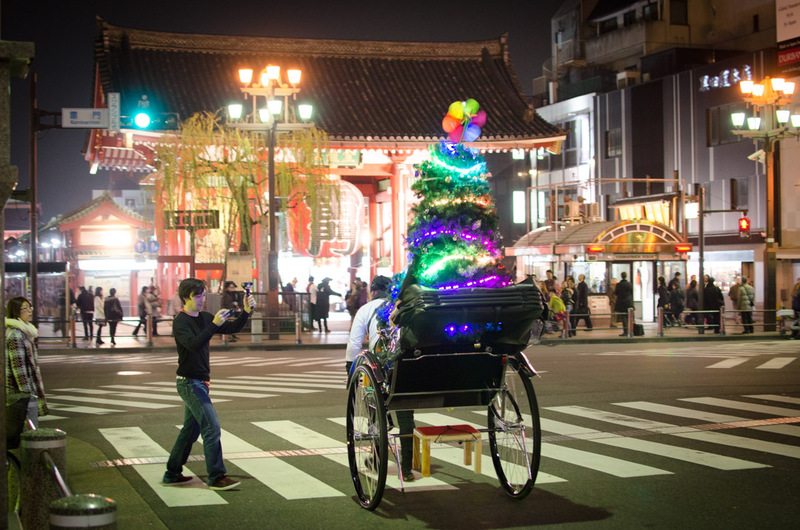 Things got off to a great start when, up in Asakusa, I was approached by a chap pulling a traditional Japanese rickshaw – would I like a ride?! Yes please!!! That was an unforgettable experience, riding through the streets with Jingle Bells playing away. Wherever we went we were greeted with laughter, smiles, and requests to take photos together. 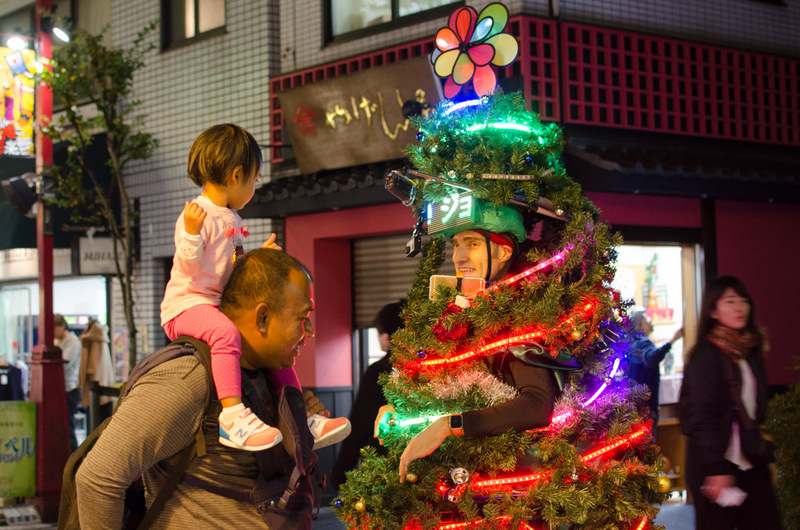 From little toddlers to salarymen, from students to grannies; the tree transcended all social barriers, bring a wave of happiness. It was a truly humbling experience, and one that would continue for the following ten days until Christmas. A couple of days later we released the first video. 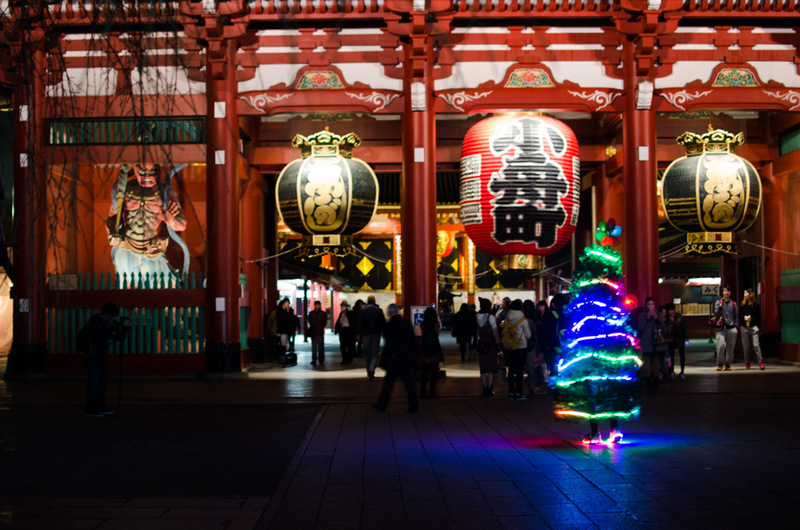 The response was fabulous, with it racking up over half a million views on YouTube, Facebook and Yahoo Japan – in fact on Christmas Eve it was the No. 2 most popular video in Japan. Next up was media outreach; I contacted about 20 TV networks and news sites, and within a couple of days the story had made its way to CNN. They loved it, and were very quick to act: within a few hours it was published an article online, and included in a TV news bulletin which was subsequently broadcast worldwide – both of these you can see here. The CNN effect was staggering. Following their report the story was published on over 100 other news portals, including top sites such as Huffington Post and Mashable. I received messages from friends around the world who’d seen me on TV. Meanwhile social media started blowing up too, with my tweets being embedded in news sites and many friends / page fans sharing my content on Facebook. 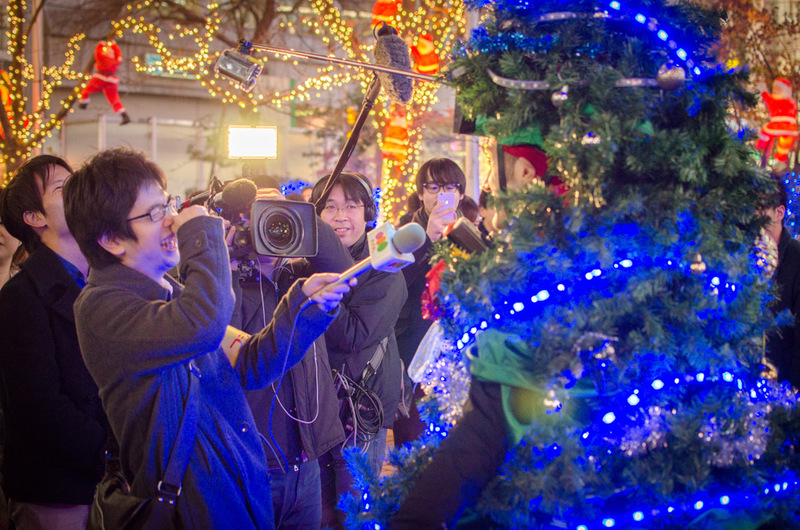 The story of the running Christmas Tree soon reached Fuji TV News (one of Japan’s top 3 national networks). It could have been thanks to an interview I’d done for a morning TV show (I’d bumped into the crew in Shibuya) or it could have ben through social media – anyhow they wanted to interview me – could they come to our place to film the preparation before joining us on the street? 2 hours later they were here, and over the next 5 hours we had a lot of fun filming everything they needed for a 3 minute video intro to the project. The best was yet to come however: the following day, in combination with showing the video report, they wanted to do a live broadcast from the streets during their early-evening news program …and so we did. This had been one of my goals, and I was delighted that we made it happen! 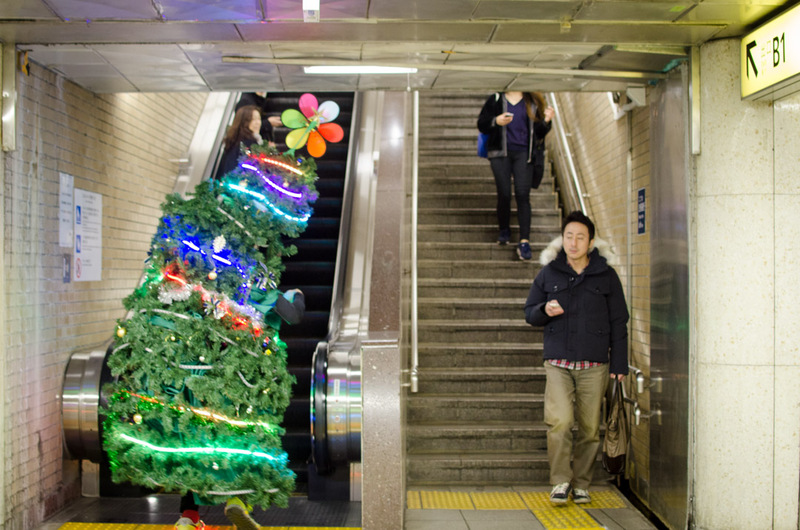 By Christmas Day itself, the tree had travelled the world – figuratively if not physically. We’d successfully got some happy / funny / crazy news into the headlines, and had a wonderful time doing so. Overall, it was a huge success, and we felt it was well worth the time and money that we’d invested. Following Christmas, it was inevitable that people started asking me, “So, are you going to do it next year? !” Well, let’s just say, never say never! The question in the meantime is what do we do with all the tree paraphernalia we have around the house… and will we ever stop finding fake pine needles everywhere?! I’d like to express my sincere thanks to the team at Breaker Inc. for producing the videos that were so key to the success of the project, to Miwo and Jonathan for volunteering their time to come out and take the photos that helped us tremendously in telling the story, to the teams at CNN and Fuji TV for helping us get the word out, to my wife, Satoko, for putting up with all the madness for a couple of months, and to everyone out there who supported the project through social media. 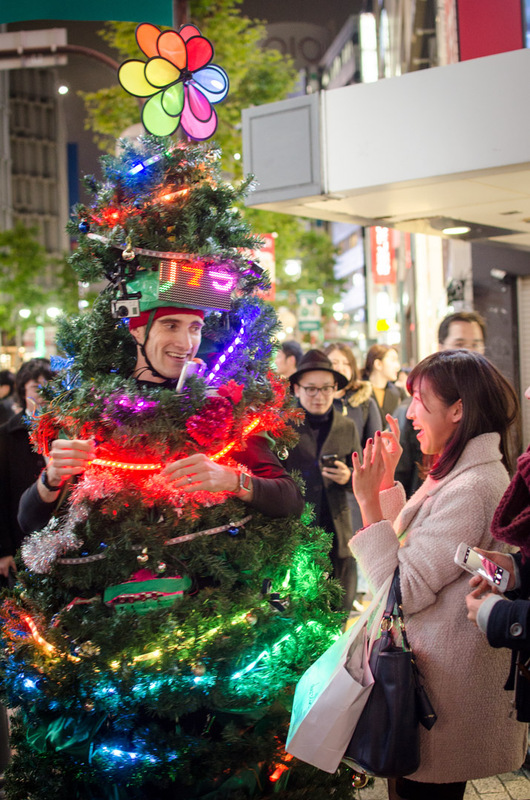 Q: What is the Homemade Wearable Battery-Powered Christmas Tree? 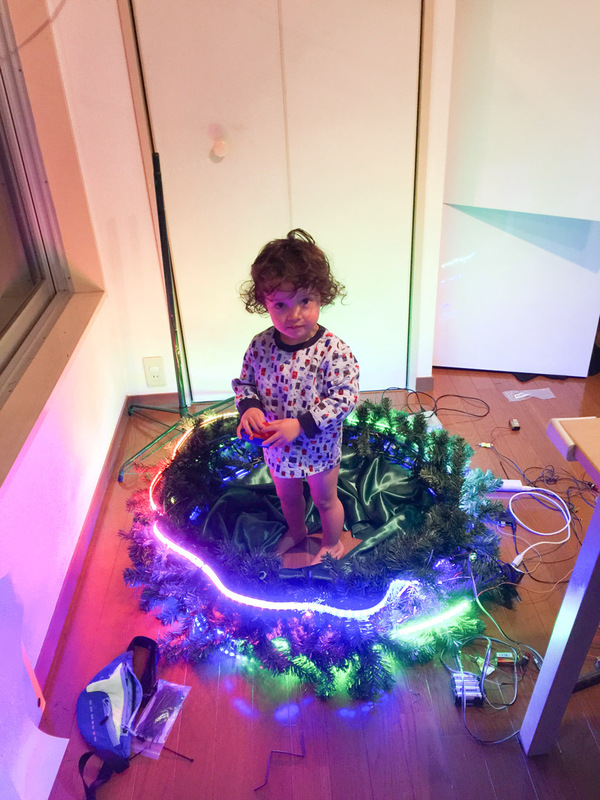 A: The Homemade Wearable Christmas Tree is a revolutionary seasonal illumination device, disrupting the traditional illumination industry by allowing for on-demand illumination of any space. 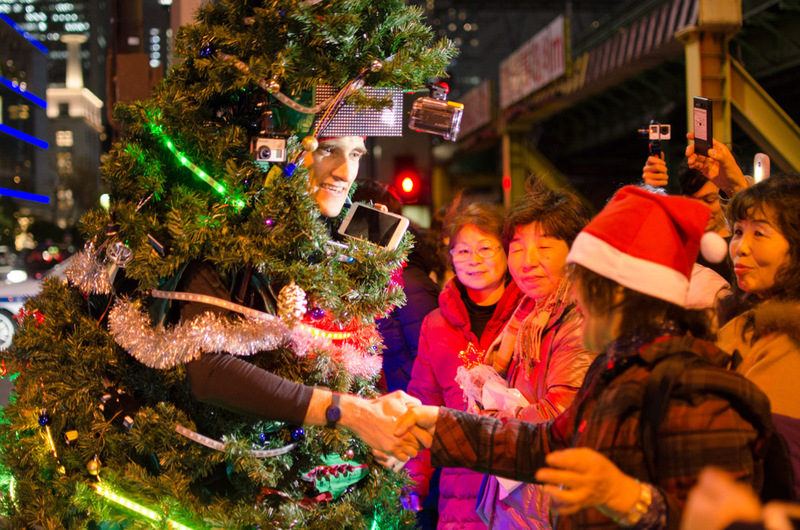 It is operated by inventor and entrepreneur Joseph Tame, who saw an opportunity to bring Christmas happiness to areas where traditional lighting does not reach. Q: What social problem does the tree solve? 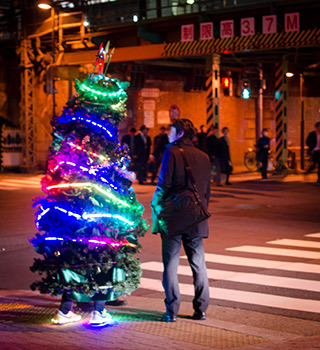 A: Tokyo-based creator Joseph Tame loved the Christmas illuminations he saw in many parts of Japan’s capital, but at the same time became keenly aware that for residents in smaller communities without big lighting budgets, and for families unable to afford their own fairy lights, the only flashing lights they were likely to enjoy were traffic lights. Joseph’s mobile Christmas tree tackles these challenges head on. 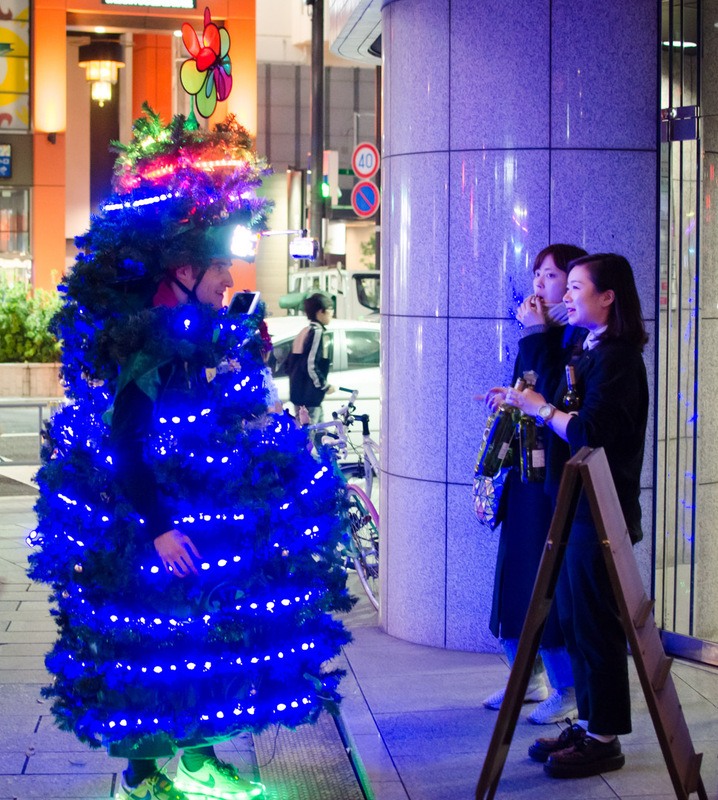 This unique new service now enables festive cheer to be felt in the darkest of alleyways and the dullest of living rooms, bringing them to life with light, laughter and a trail of pine needles. Q: What happens when the tree arrives? 7 seconds ~ 10 minutes: Photos are taken, Christmas chocolate is handed out, everyone is happy and goes home to tell family and friends of their unforgettable experience with a tree. Q: How can I book the tree? A: Just like Uber, the tree is available on demand via your smartphone using the links below, and from Dec 26th 2015 via our new iOS app. The tree can come to you wherever you are in the world, but please note that depending on your location it may take a bit of time to reach you; with a combined weight of 93kg (68kg of Joseph + 25kg of Tree) it is currently too heavy for delivery by drone, and is not yet available from Amazon Prime due to there only being one of him. Q: Can I surprise my family or friends by sending the tree to them? A: Sure! This service makes the perfect gift for someone who is difficult to buy for. Just use the links below to let us know where and when the tree needs to be somewhere, and it will be done. Like magic, only it will probably involve things like cars, trains and possibly planes and lots of confused transport officials. 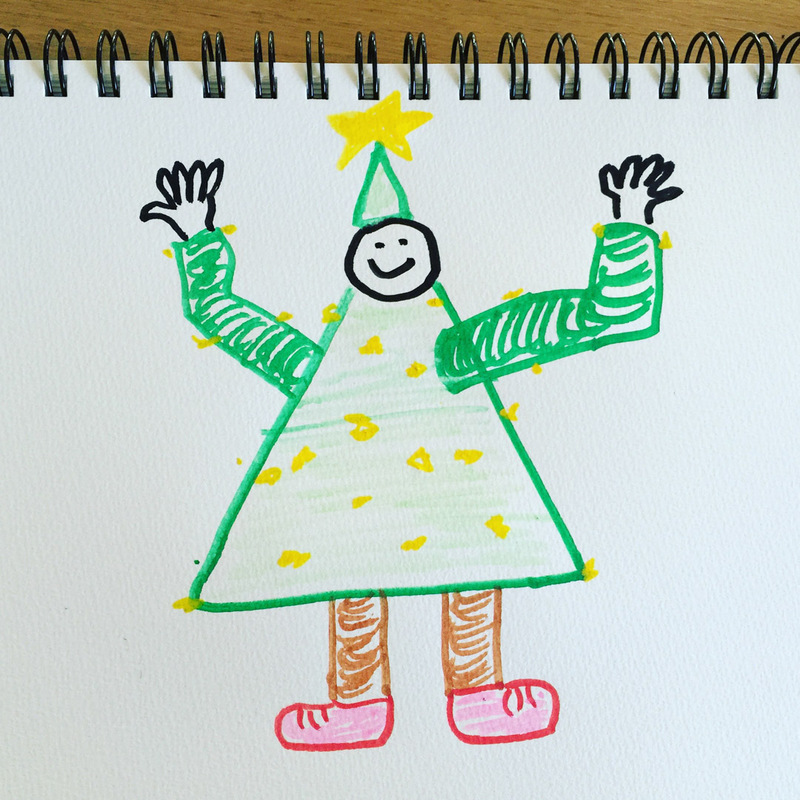 The On-demand Human Christmas Tree app is due for release on December 26th 2016. BOOK YOUR TREE EXPERIENCE NOW! 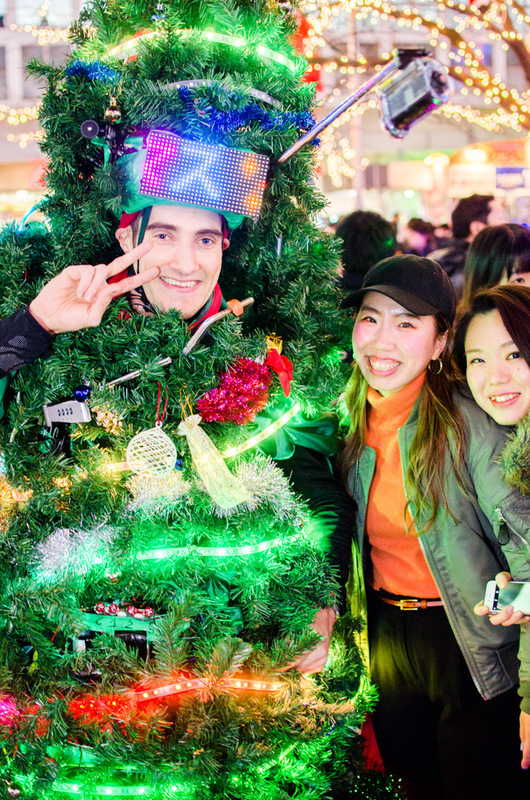 For that special someone who needs some magical light in their lives: Give the gift of happiness by sending the homemade wearable battery-powered Christmas Tree to visit your friend or family member. Joseph can also make special deliveries of other gifts, play Christmas music, tell Christmas jokes, dance like a Christmas tree and flash his LEDs in any color desired. For those who haven’t managed to sort out their own Christmas Tree, Joseph can stand in the corner of the lounge and not say anything, provided he is fed with mince pies at regular intervals. Delivery available both within Japan and internationally, although please note that Joseph cannot be sent by mail due to not having the flexibility required to fit in an envelope. Feeling lonely without a tree in your life? No problem – book online and you will soon be able to feel the bristle of fake pine needles against your ankles. All optional extras listed in Option 1 are also available, including international delivery. 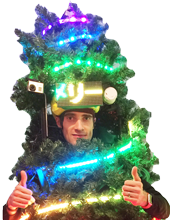 Help support the wearable Christmas Tree in its efforts to bring light into the lives of those who need it. This tree eats batteries at a rate of 100 per 90 minutes. 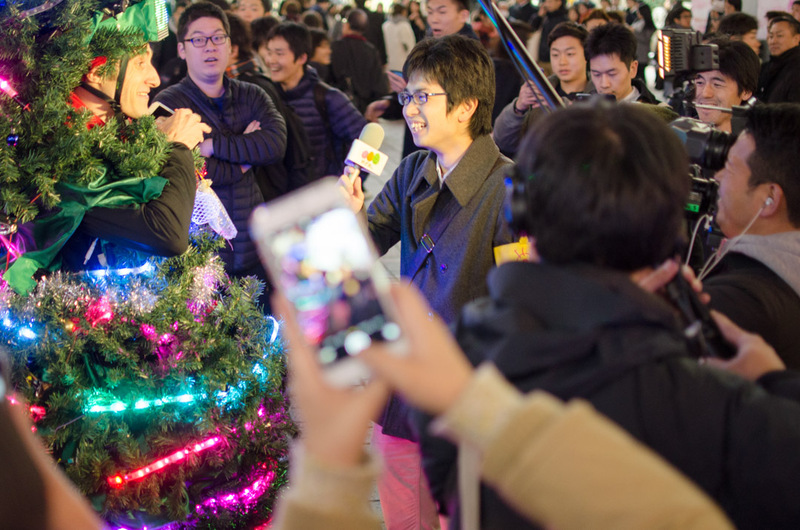 2) receive a special thank you video message from me in which I will talk in the accent of a Christmas Tree, which is very difficult to do.